Well hellooo there bum cheeks! 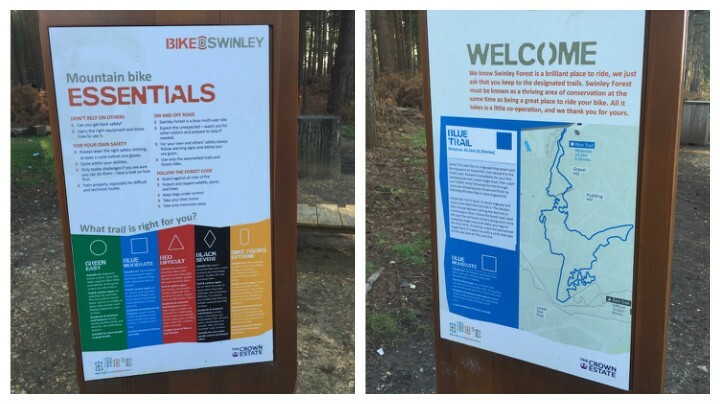 You’re making yourselves known after our mountain bike trail in Swinley Forest. Someone get me a bag of frozen peas! As you can probably guess, I am most definitely *not* a natural mountain biker. In fact, the last time I rode a bike, I think it was a Chopper (and I don’t mean in a retro way, I mean in 1978). 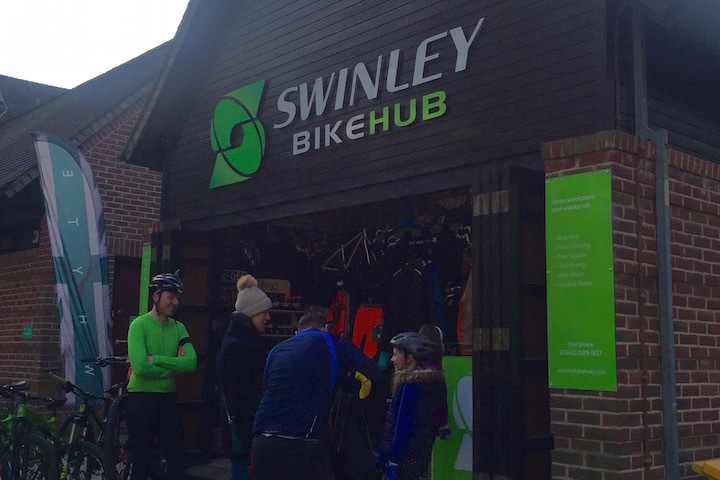 So it was with more than a little trepidation that I rocked up to Swinley Bike Hub in Swinley Forest, Bracknell with the Muddy Family in tow. Along with two child bikes; one dog; and a rucksack with enough Cadbury’s to sustain us (ok, me) for a week. 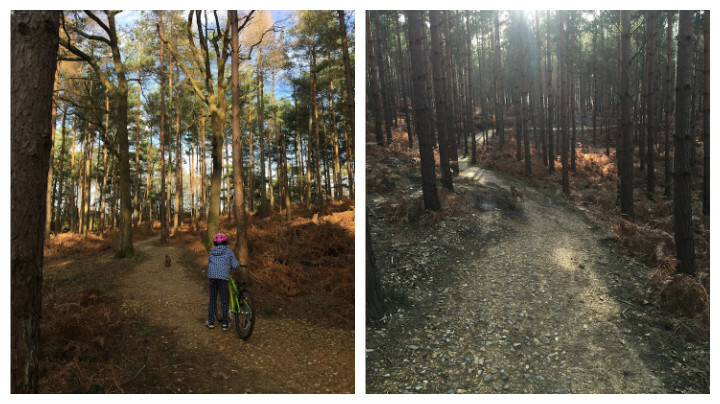 Because it’s a forest and I’m rubbish with maps, and Mr P, gorgeous as he is… Bear Grylls he ain’t. With my slick organisational skills I’d naturally planned this little Muddy excursion weeks in advance… nah, not really. I rang that morning begging to hire bikes in the next half an hour. Because if this family didn’t get out and get some fresh air pronto, we were going to murder each other. 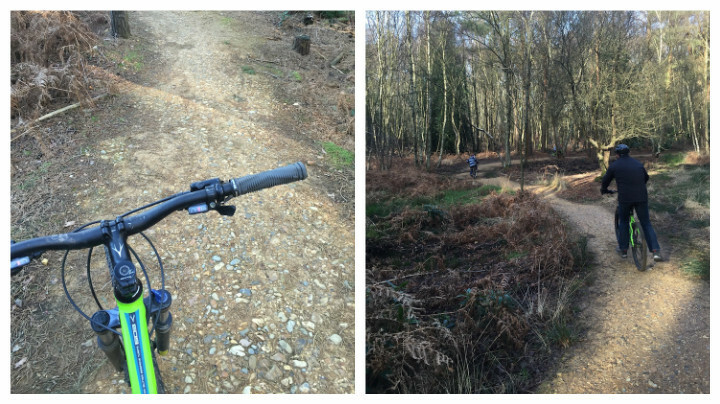 I don’t recommend you leave it as late as I did, the Hub suggest pre-booking to avoid disappointment as the forest has some of the best mountain biking in the South East and is hugely popular on weekends with amateurs and pros alike. While we were there a very cool looking biker dude rocked up to talk to Tristan. 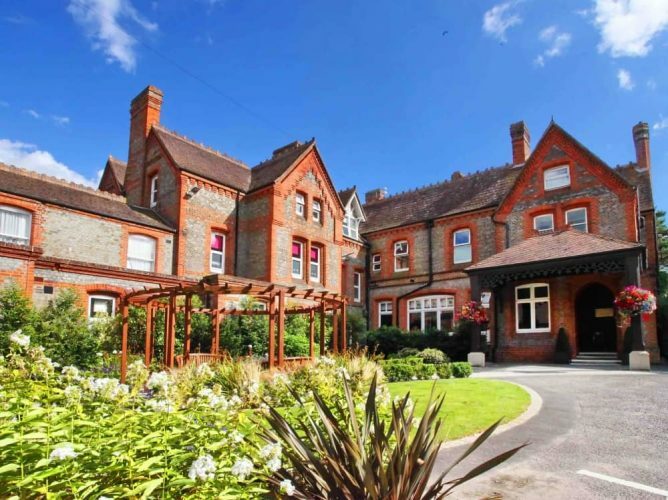 and all the staff went a bit haywire – apparently he was totally *famous*! Don’t ask me his name, I was too busy trying to look cool in my helmet. 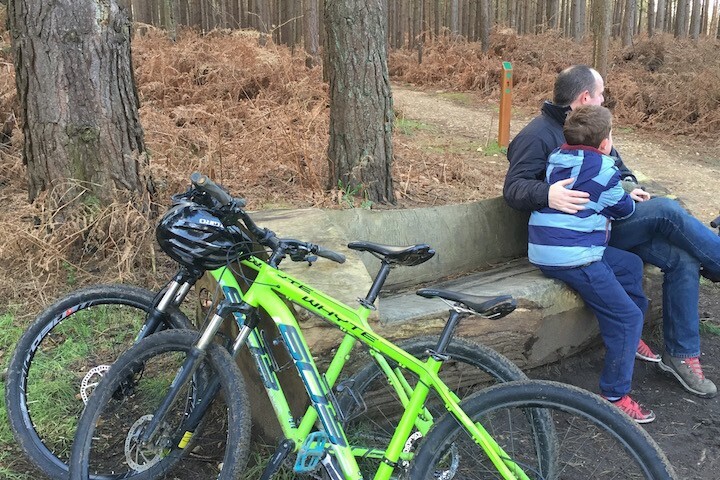 Anyway, we managed to hire two very natty adult bikes (all the bikes are Whyte Bikes, a UK mountain bike brand, and very well maintained) and the littlest Muddies took their own, although you can hire child bikes too – even balance bikes. The forest has fire roads throughout which are perfect to let little ones have a go and feel part of the fun. All kitted out and raring to go, we chose our trail. 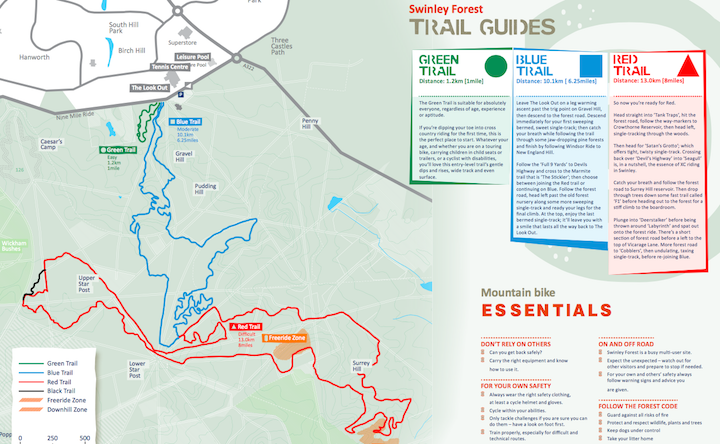 Swinley Forest has 24km of purpose built, marked mountain bike trails. Just like ski slopes, the trails are graded according to ability. So Green is easy and suitable for beginners; Blue is moderate and good for intermediate cyclists; Red is Difficult, and so on. I think it’s unlikely you’ll ever see me tearing it up on the Black Trail, and there’s also something called Bike Parks Extreme – even the name makes me feel queasy. Given we were newbies at this mountain biking lark, the Hub’s owner, Tristan, recommended we start with Green (oh the relief!) and progress to the Blue trail once we’d done the Green a few times. So off we pootled with Digby merrily trotting along leading the way. Dogs are allowed on the trails but not actively encouraged, especially at busy times like on weekends. I would only consider taking your dog on a quiet day if they have excellent recall. Although the green trail is relatively quiet, the other trails get busy and some mountain bikers when going full throttle are FAST. Dogs, wheels and spokes don’t mix. After a wobbly start, we all found our feet/wheels, and started to really enjoy ourselves. The trail itself is 1km in length and relatively flat with just the occasional gentle incline and decline. 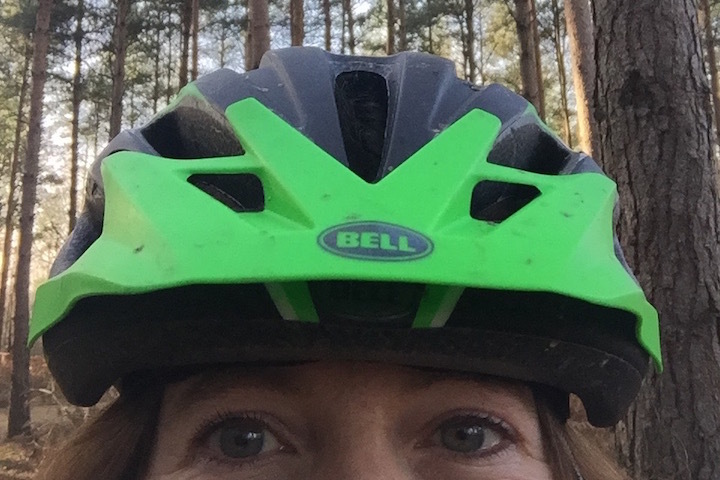 It’s about 2m in width and the surface is a little uneven, loose and muddy in parts – all adding to the experience and making you feel incredibly gnarly (even though I probably looked more like Miss Marple cycling to church). My two little townies (who don’t get much bike action) tackled it just fine in about 10-15 minutes. We were perfectly happy just sticking to the green trail and improving on our speed each time round, or having races, or trying different methods of getting over bumps and so on. 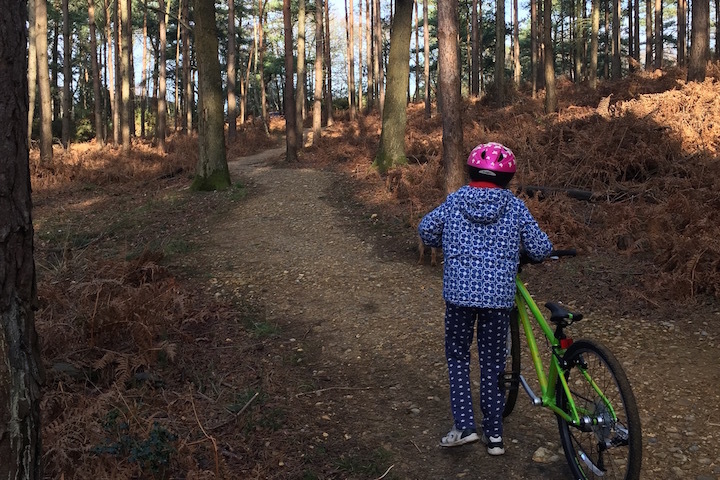 I would imagine if your children cycle a lot, they would be itching to try the blue trail which is 10.1km and according to Tristan, takes about two hours on average to complete. The forest is absolutely beautiful and is designated as a Special Protection Area (SPA) due to the rare European based ground nesting birds (including the Nightjar, Dartford Warbler and Woodlark for all you twitchers out there! I’m sure I spotted Bill Oddie). There’s also a Go Ape here, so we’ll definitely be back to try that out. And there’s more… Tristan is in the process of organising a Kids Club at the Hub. Taking small groups of maybe five or six children onto the trail with a few instructors and giving them a lesson. Parents can either go off on the trails themselves or kick back in the cafe at The Look Out Discovery Centre next door (hmm, let me give that some thought…). Should be available in time for the Easter holidays so I’ll report back as soon as I know it’s up and running. 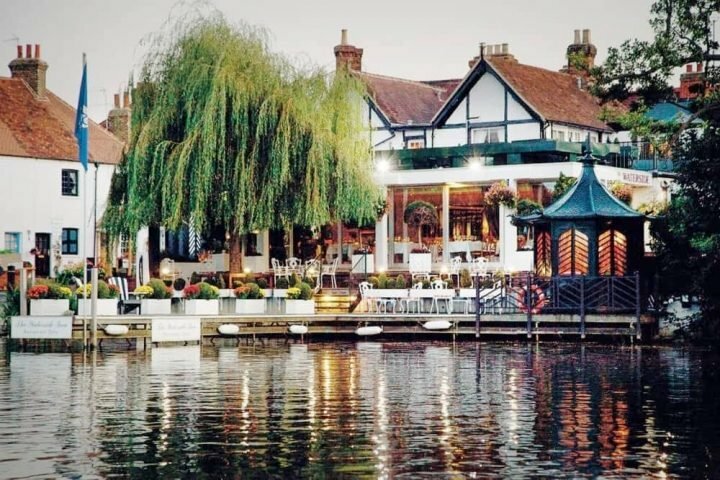 After all that exercise you’re going to be starving so you can either pop next door, or do what we did and head to Blues Smokehouse in nearby Bracknell. 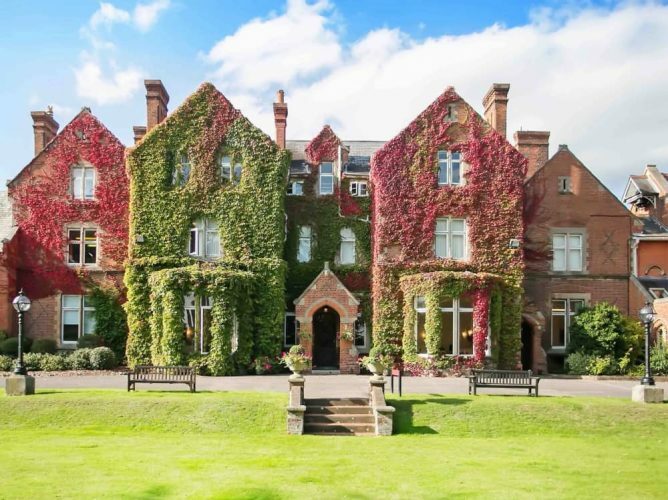 It’s only a five-minute drive, you can park in the Princess Square shopping centre next door, and the food is well matched to the appetite you’ll work up on the trail. Review of that coming soon.